Today's post is going to be a community service one, I will be sharing useful information about GTBank's financial products. As it will be a lengthy post, I'll go straight to the crux. I carefully gathered the details word for word from GTB's website. I made sure I didn't edit it, so you can be sure you're reading from the horse's mouth. A Personalized Naira MasterCard will be issued for you. Our Naira MasterCard can be used for online payments at POS terminals and cash withdrawals at ATMs that bear the MasterCard logo anywhere in the world. GT-Target is a high interest bearing account that encourages financial discipline through savings. This product is designed to enable you save towards a specific target - whether it’s a wedding, holiday, new car or higher education. Whatever your financial goal is, the GT Target account can help you achieve it. To own and operate a GT Target Account you must have an existing GTBank Account. Open a Guaranty Trust Current Account today to access a wide range of channels from anywhere in the world, that will make your financial activities more pleasurable and convenient. A Chequebook will be issued based on request at any of our branches nationwide. You will be profiled for Internet banking, GTConnect (telephone banking) and GTBank Electronic Notification Service. Our Domiciliary Account is designed to help you conveniently carry out foreign currency transactions from the comfort of your home, office or abroad. The account can be funded in Dollars, Pounds or Euro through travellers cheques, foreign currency cheque lodgments, cash inflows and deposits. Cash withdrawals (in USD, Pounds sterling, Euro) from any GTBank branch. Transfer funds to other bank's domiciliary accounts in Nigeria and abroad. Free access to all our services: on-line/ real time banking, SMS banking and Internet banking. The GTCrea8 e-Savers account is a card-based interest bearing account designed to allow undergraduates maintain a value adding banking relationship using our electronic channels. Freedom to pay into your account through the GTBank internet banking platform, via our cash deposit ATMs or at any of our branches nationwide. Purchase of airtime, transfer money to your friends, pay DSTV bills and perform other transactions through Internet Banking, GTConnect and GTMobile. GTMax is a premium, high yield, current account product that is best suited for customers that have more inflow transactions than outflows. GTMax is designed to provide maximum interest payments on your daily account balances and minimum charges on transactions. GTMax is a product which comes in three packages, Gold, Silver and Platinum. You earn interest** if you maintain the agreed minimum balance. Cheque books on all GTMax accounts are FREE! GTMax is a non borrowing account (There will be no credit facility of any kind on this account). Allows you to pay in all clearing instruments i.e. cheques, dividend warrants e.t.c. The GTMax cheques you issue can be paid into any bank. The account can be used as a salary account. Free access to all our services: on-line/ real time banking, SMS banking and e-banking (both Internet banking & banking via ATMs). * In any month you make more than 5 withdrawals, a Commission on Turnover (COT) charge of =N=5/mille will apply on all transactions for the month. ** If you withdraw below the minimum account balance in any month, you will forfeit the interest benefit on the account for the month and COT will be charged at =N5=/mille on all transactions for the month. 1 Passport photograph of authorized signatories. Copies of acceptable means of identification (Driver's License, International passport, National I.D Card, and any other acceptable identification document deemed fit by the Bank). Copies of acceptable means of identification (Driver's License, International passport National I.D card, and any other acceptable identification document deemed fit by the Bank). Duly completed signature account opening form. Small businesses are to submit Certificate of Registration of Business Name and form 2. Limited liability companies are to submit certificate of incorporation, form CO7, and memorandum & articles of association (MEMAT). The Seniors account is a current account which offers free banking services to senior citizens who are aged 65 years and above. It is a checking account which allows senior citizens to carry out banking transactions with ease from any of our branches nationwide. Senior citizens can effect transactions on the Seniors account via the use of Cheques, ATM debit card or our various electronic channels (Internet banking, telephone banking and GTConnect our interactive contact centre). One passport photograph of the account holder. Copy of a utility bill issued within the last three months. (Originals should be brought to any of our branches for sighting). Identification document for each signatory e.g International Passport, National ID Card, National Drivers License etc (Originals should be brought to any of our branches for sighting). One reference form duly completed by an individual or corporate body maintaining a current account with a bank in Nigeria. 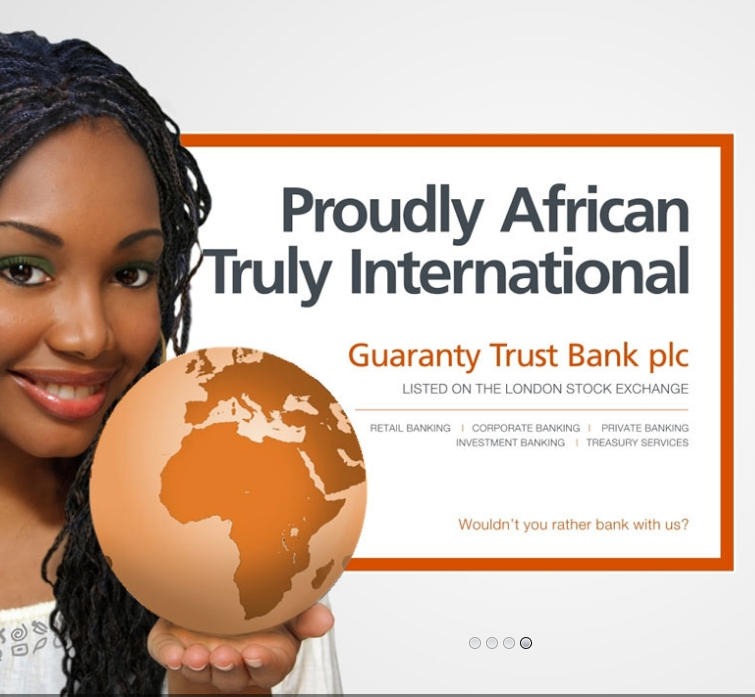 The Non Resident Nigerian (NRN) Services from Guaranty Trust Bank provides Nigerians living abroad with access to a wide range of products and services; some of which include Savings and Current accounts, Investment in Money Market instruments, eBanking services and Card products as well as access to our ultra modern Contact centre: GTConnect. This innovative service offers Nigerians in Diaspora the opportunity to open and operate a Nigerian bank account from anywhere in the world. a. Duly completed Account Opening Form. b. One Passport Photograph showing full face forward. (i) a. One reference letter obtained from a current Banker or Banker's confirmation. b. One reference letter from a Current account holder (Nigerian) with any Nigerian Bank. * For Joint account only, kindly attach a notarized copy of your marriage certificate. * NRNs who have Current accounts with GTBank UK do not require references to open an NRN account. The Smart Kids Save account is designed to enable parents/guardians save for their children aged between 0 – 17 years, whilst also developing a savings culture in them. Teaching children the value of savings early can help them develop SMART financial habits for life. *The SKS Teen account is an additional account opened when the Smart Kid is/becomes 13 years and older. Minimum opening/account balance of N1, 000.00 (One Thousand Naira Only). A free branded gift item when an SKS account is opened with a minimum of N10,000. Periodic lodgments can be made into the account through Standing Order/automated direct debits. From the age of 13, an SKS Teen account will be opened for the teenager which comes with a free Trendy Teen MasterCard (issued upon Parent’s request) so the child can learn to manage money responsibly. One passport photograph of each signatory and Smart Kid. Valid ID for each signatory (International Passport, National Driver's license, National ID Card). Copy of Smart Kid's birth Certificate. gooday please can an SKS Naira Mastercard be used for Online Transactions like Buying things from JUMIA? what is skn account account?